Super Sonico debuted in 2006 as the Nitroplus mascot for the Japanese game company’s annual music festival “Nitro Super Sonic”. Sonico is a full-time student, part-time gravure model, and the guitar/vocalist for First Astronomical Velocity (FAV, or Daiichi Uchuu Sokudo). Super Sonico lives alone with her five cats, and enjoys taking baths, playing video games and cooking Japanese food. Her favorite artists include Nirvana, Foo Fighters, Sonic Youth, Iggy and the Stooges, The Clash, and has recently developed an affection for Maximum the Hormone. Super Sonico has been featured in numerous games, books, figures, and anime, and her official Twitter account has over 70,000 followers. 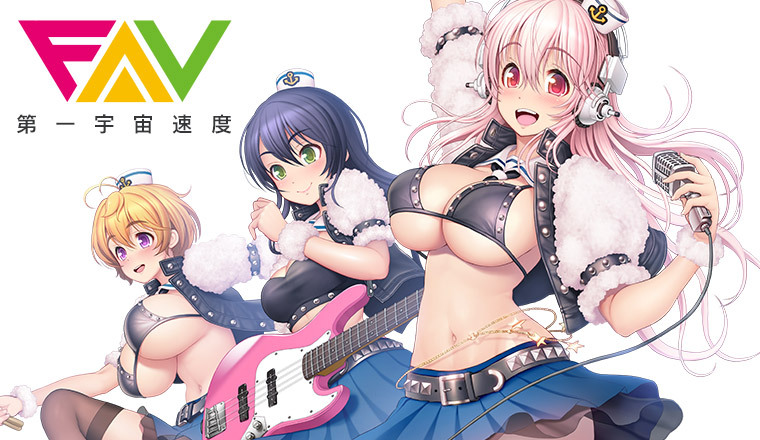 Super Sonico also makes an appearance in the PS3/PS4 game Nitroplus Blasterz: Heroines Infinite Duel with her band mates (and cats) helping her in combat. Nitroplus Blasterz: Heroines Infinite Duel was released on PlayStation 3 and PlayStation 4 in February 2016 in the United States.